Nisha lost her brother and wanted to get all the accessories he wore, tattooed permanently on her body. Though we never asked how he passed but just by doing this tattoo we knew what it meant to Nisha. The accessories were carefully placed in the singing bowl and did a photography session keeping only one thing in mind to compose this design well and that it fits perfectly on her shoulder blade. After 12 hours of work, here's the result. In our opinion the shin is one of the most painful areas to get tattooed but Alex proved us wrong. He sat like a rock for over 10 hours for his tattoo without a hitch! The better the client sits, the better the tattoo will be. 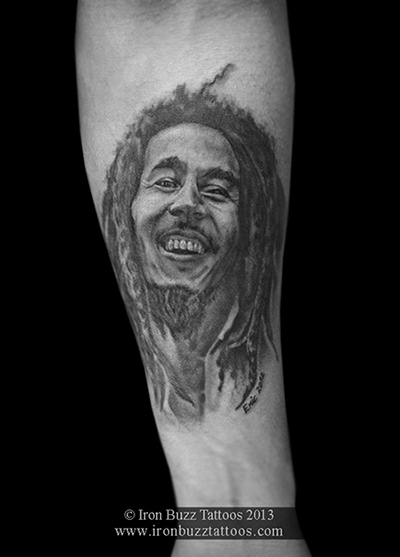 Year 2012 was when Eric got a portrait of Nelson Mandel tattooed on him for reasons varying from supporting Africa to standing up against racism and a tribute to his african team-mates during my football career. But little did he know that someday an amazing human like Alexis would walk into Iron Buzz and get inspired to get a portrait on himself. Eric's heart sank when Alex told him about his decision and Eric knew he had to give him the best tattoo possible. Madiba once said "After climbing a great hill, one only finds that there are many more hills to climb." Long live Mandela! 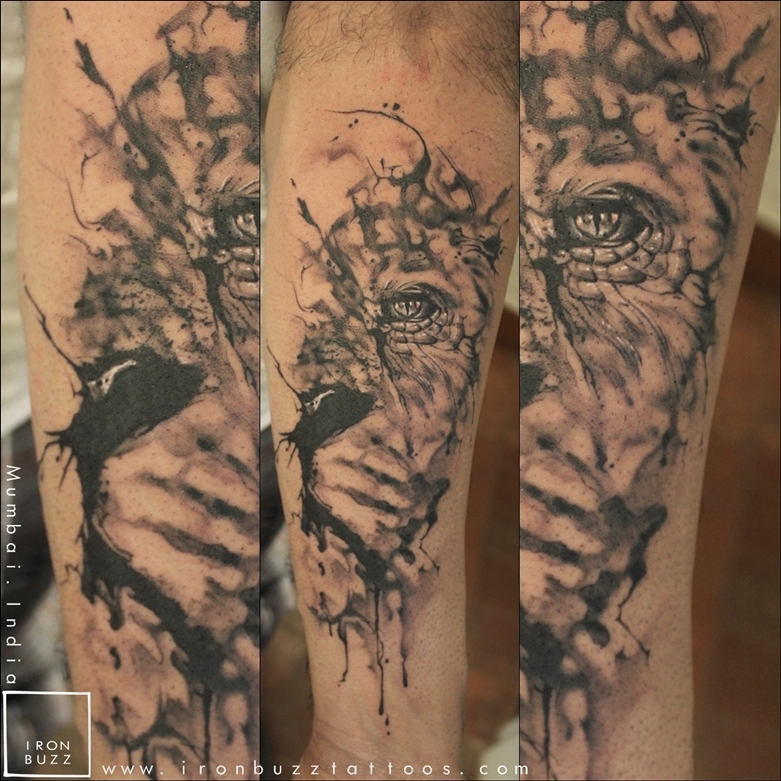 This tattoo of the African elephant was done on our client Dave and this is his second tattoo by Eric. This came out really well especially the watercolour effect used behind the elephant is magnificient! HEALED tattoo pic. 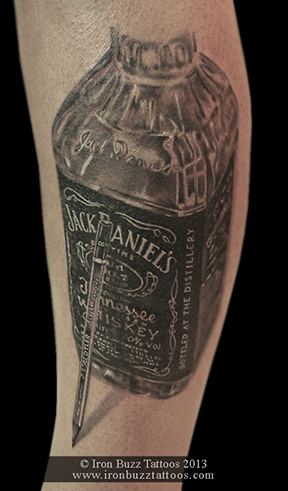 We wont say much just watch this awesome video we shot while doing this tattoo. In this video, Eric tattoos a portrait of legendary character Tyrion Lannister played by Peter Dinklage from the most famous TV series Game of Thrones. 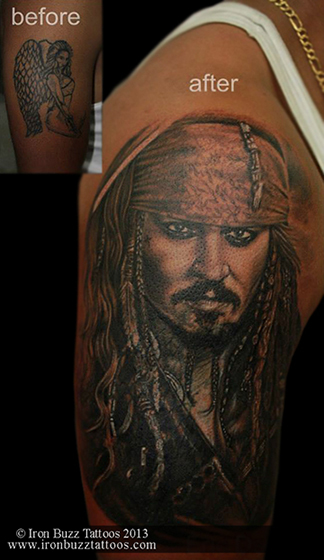 This highly detailed portrait tattoo took him around 10 hours to complete. "If a dog doesn't come to you after having looked you in the face, you should go home and examine your conscience." Delnaaz got a portrait of her pet dog DEMON and she sat over 7 hours for this beautiful piece. Watch the timelapse of this tattoo right here. The fastest land animal in the world, the cheetah is a marvel of evolution. The cheetah's slender, long-legged body is built for speed. Cheetahs are tan in color with black spots all over their bodies. They can also be distinguished from other big cats by their smaller size, spotted coats, small heads and ears and distinctive "tear stripes" that stretch from the corner of the eye to the side of the nose. When cheetahs run, they use their tails to help them steer and turn in the direction they want to go, like the rudder of a boat. 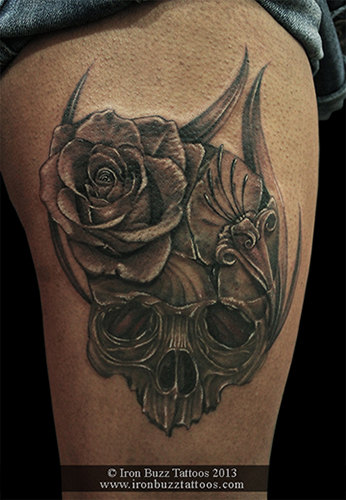 Our client Kanak had an existing tattoo of a rose that she got some time ago but it did'nt meet her expectations at all. 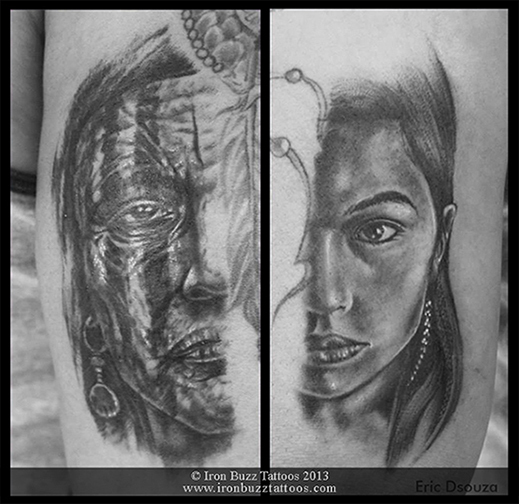 Our award winning artist Eric took up the challenge and went on to do one of the best cover-up tattoos ever. What do you think? 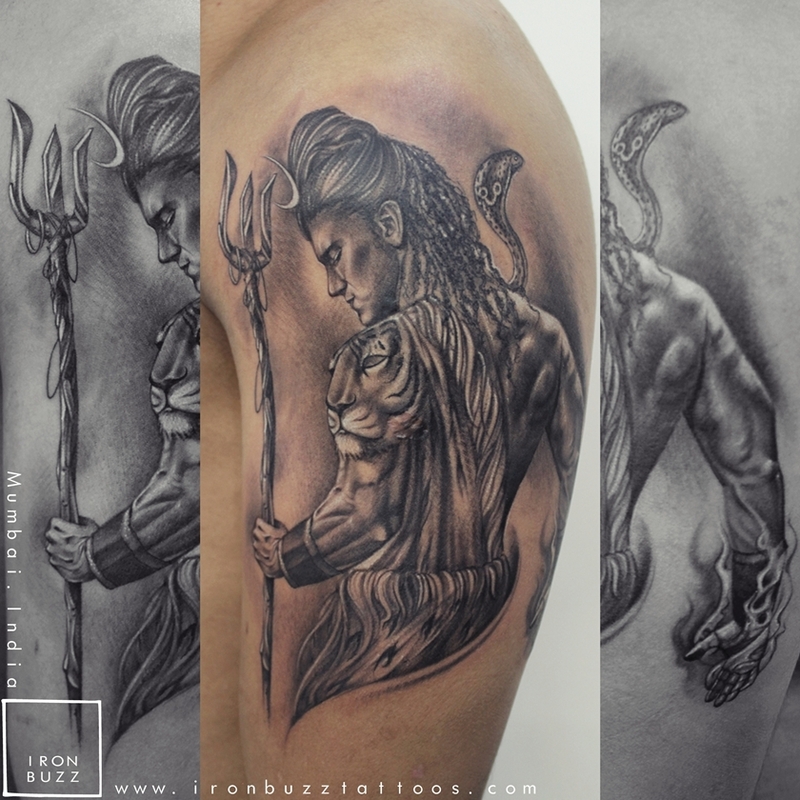 The Hindu God of Destruction, Lord Shiva, is one of the most favoured for tattoos in India . 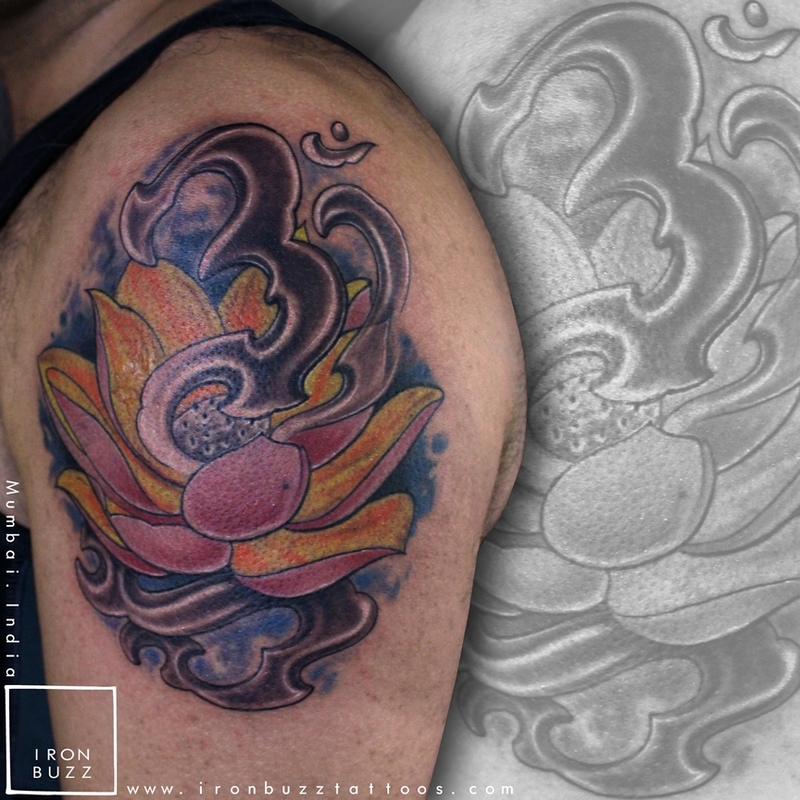 He is immensely popular with those who want a design to reflect their spiritual beliefs. Lord Shiva is also considered, ‘the good one’, since his destruction targets evil and sorrow. Shiva is the Lord of mercy and compassion. He protects us from the forces of lust, greed, and anger, but also bestows grace and awakens wisdom in his devotees. 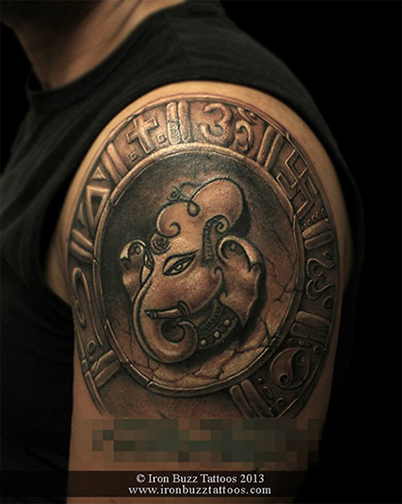 Patrick is a tattoo collector who traveled to India and wanted to get an aquarelle style Lord Ganesha tattoo done here. After a lot of research he chose us and Eric kind of went experimental on his tattoo. What do you guys think? When you hear the name 'Laica' what do you remember first? Not sure? Well the name of the first dog to enter space was 'Laica'. Similarly when Savithra's family decided to get their first pet dog, she found this pup and immediately got her home and named her LAICA. Laica was part of the family for 15 long years. In memory of her, Savithra got this tattoo on her forearm. The reference image provided to us wasn't the best but we made sure the tattoo looked better. What do you guys think? Kent Nerburn once said "Until you have a son of your own... you will never know the joy, the love beyond feeling that resonates in the heart of a father as he looks upon his son." This is Sachin's gift to his son Ekansh on his 4th birthday. Need we say more? Arjun was certain about what he wanted. But he didn't expect a realistic tattoo like tis when he said he wanted a skull and a crown. "As long as the tattoo looked nice the reason behind it doesn't matter" says Arjun. Denese got this tattoo on the inner left bicep and this was her first tattoo so she wanted to make sure that whatever she puts on her body, she has to love it for the rest of her life. She told us that her father calls her a queen and her mother calls her a black cat after Denese's obsession with black. After 4 tries this is what we came up with. 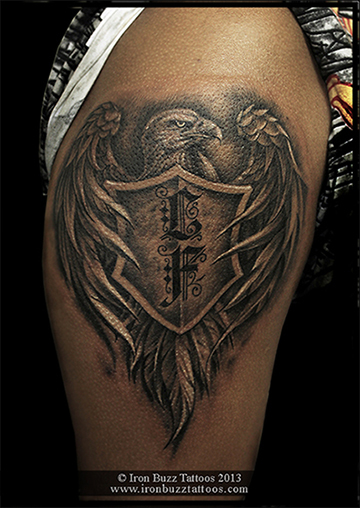 Design and Tattoo executed by our artist Eric Jason D'souza. Hope you like it. Nikhil sees a role model in his father who secretly admires his son's efforts in dealing with life and society. 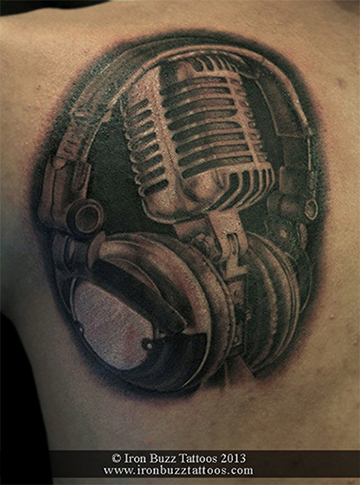 In return for the admiration, Nikhil wanted to dedicate a tattoo for his dad but was unsure about ideas for the tattoo. The best example was how a Lion moulds his cub into being a predator and into a king of his pride. We wont say much here. Just enjoy the good work. Aakash wanted to capture a different perspective of pain Jesus Christ went through on the crucifix / cross. This image reference is taken from the movie 'The Passion of Christ'. 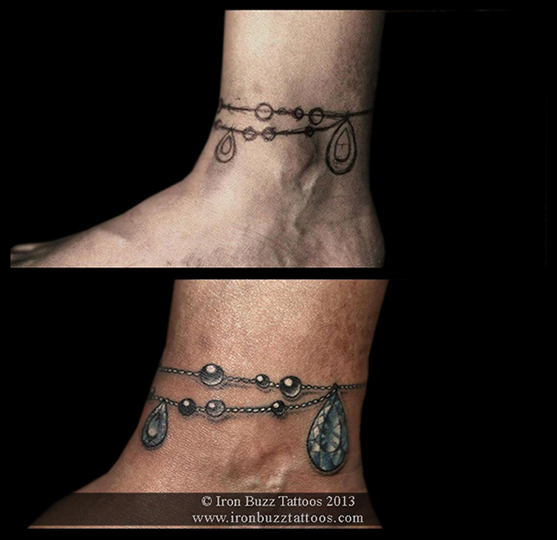 It took us a total of 10 hours to create this highly detailed tattoo. Hope you like it. Tattoo done 2 months ago: Katja and her husband lived in India for nearly 2 years and before they bid goodbye to our beautiful country, they both wanted to get a tattoo representing their stay here. 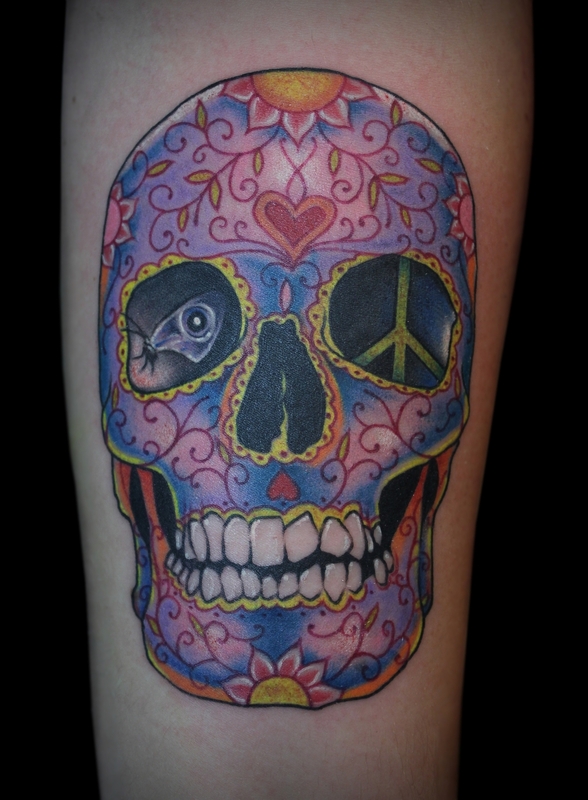 This is Katja's Paisley tattoo with amazing colours to complement it. 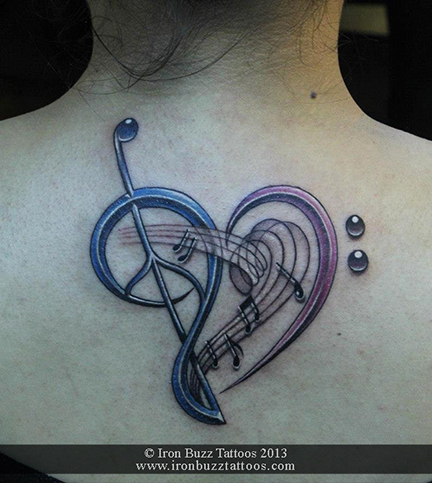 Katja was very specific about what she wanted as her first tattoo and we gave her just that! I hope you lovely people out there like it too! Cheers! 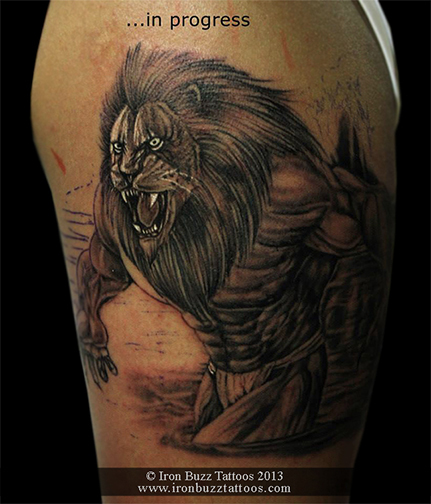 This is an in-progress picture of Angad's sleeve tattoo which also needs a cover-up. 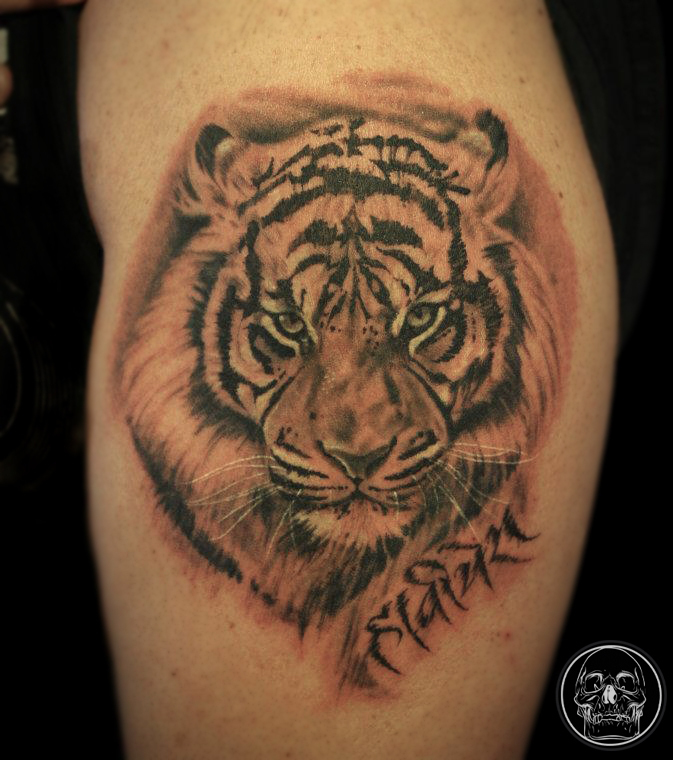 We started off with this Tiger portrait. More to come on this sleeve. Natasha had an old tattoo she didn't want anymore and wanted us to work on it. The best we could suggest was to cover-up the tattoo than work on the same tattoo again. The Ancient Greeks and Romans believed the seahorse was an attribute of the sea god Neptune/Poseidon and as such, the seahorse was considered a symbol of strength and power. After reading and researching more on this lovely species, we decided to go ahead and freehand the design directly on skin with a pen and we love the outcome! What do you guys think? This is Eric's first color portrait of none other than the King of Pop Michael Jackson done on our dear client Josie. 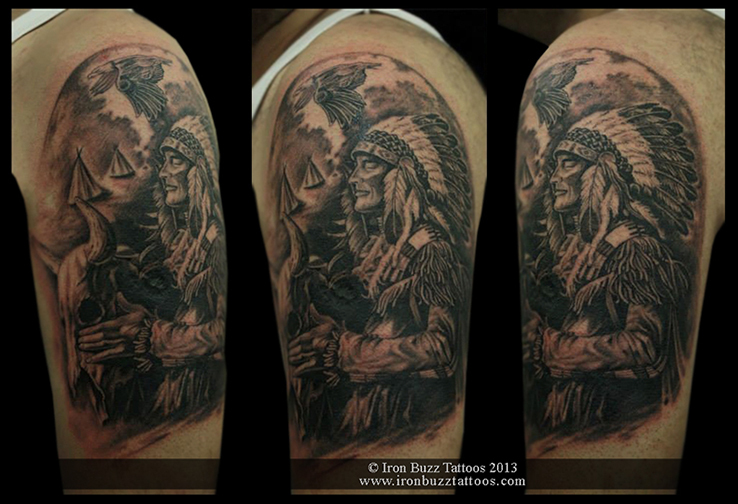 Done using Intenze tattoo inks. 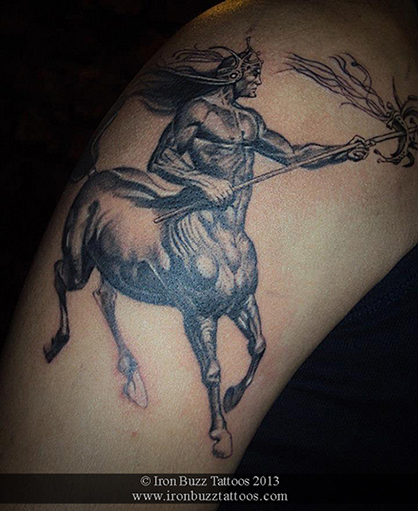 This tattoo we did on David is in memory of his sister who was an avid horse rider and loved snakes. We thought of merging both the concepts on a leather armband which wraps around his arm like a belt. Everything except the outer border is HEALED! Bishop Rotary, Stigma Hyper V3, Inkmachines Dragonfly. Sebastian is a German national who waited to get tattooed for 20 years. Being in India for roughly 2 years, he researched about tattoo shops around and he found us last September. 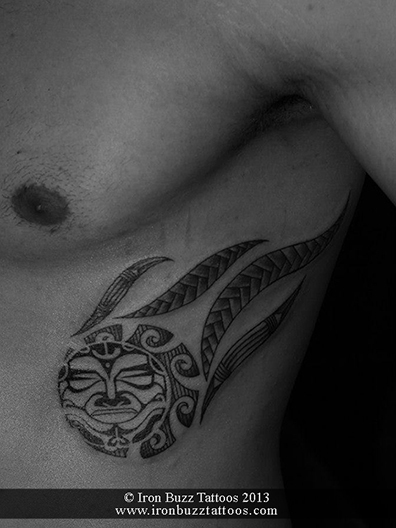 After a year of design research he loved the Maori and Polynesian tribe inspired tattoos. Being an avid scuba diver, he knew he wanted a turtle in there somewhere. After going through a lot of references, this is what we came up with and Sebastian has a brand new tattoo to take back home. We took reference from a lot of Armour pictures available online and came up with this Celtic inspired Knight's armour for Kelly who traveled all the way from Qatar to get this tattoo done. 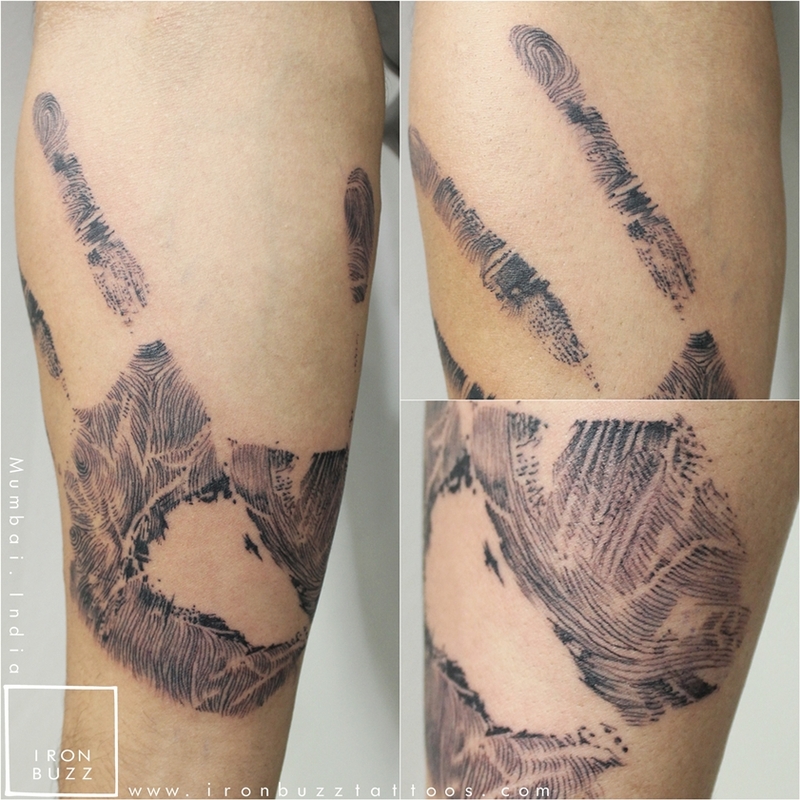 He was extremely happy with the outcome and even got another tattoo on his thigh on the later part of the 2nd day. 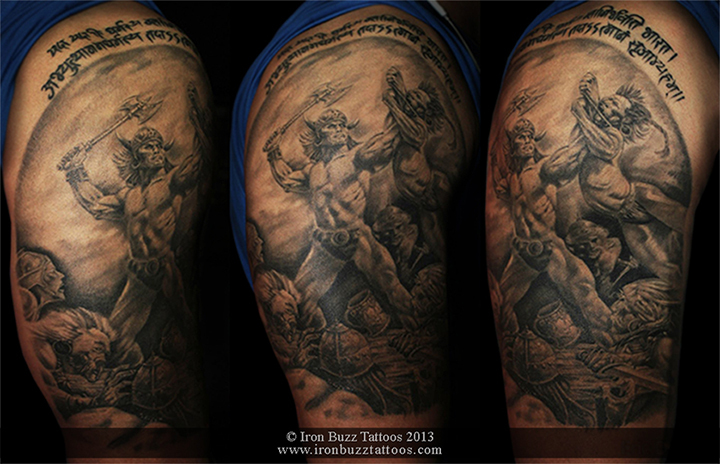 Eric completed this tattoo over a span of 2 days and a a total of over 14 hours. In Eric's and Kelly's words "This tattoo isn't over just yet!". Unfortunately we do not have a before picture of the tattoo Manthan had on his forearm but it read EST 1988 on the left side of this tattoo. We did this unknown portrait with Sacred geometry in the Dotism style. We hope you like the outcome. We will be posting a healed pic of the tattoo soon enough. 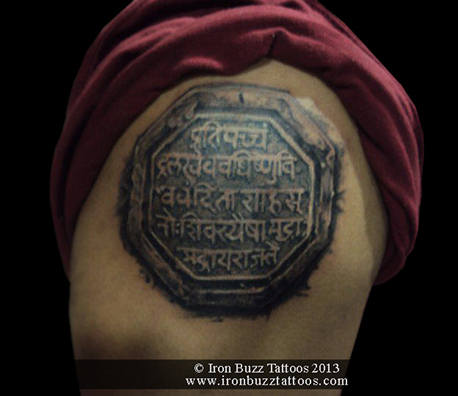 So finally we met Manthan for his new tattoo, this was the best chance to get a pic of his previous tattoo we did. Manthan had a set of Kanji symbols that he needed to cover. 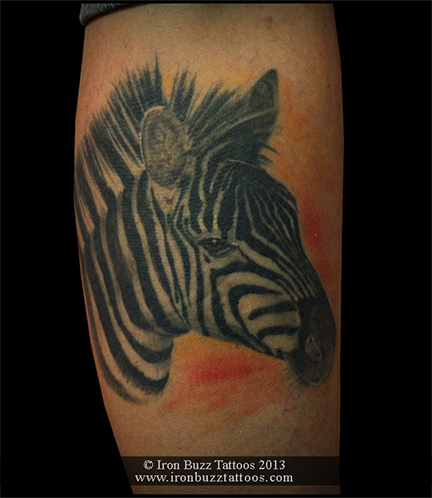 We did this tattoo design on him and here's a healed shot. We will have to do another session to tighten and darken things around in the tattoo, as you can see the solid black kanji symbol is still visible just above the Lotus. Cover-ups can be tough but not impossible. This is the first sitting done on Glare. 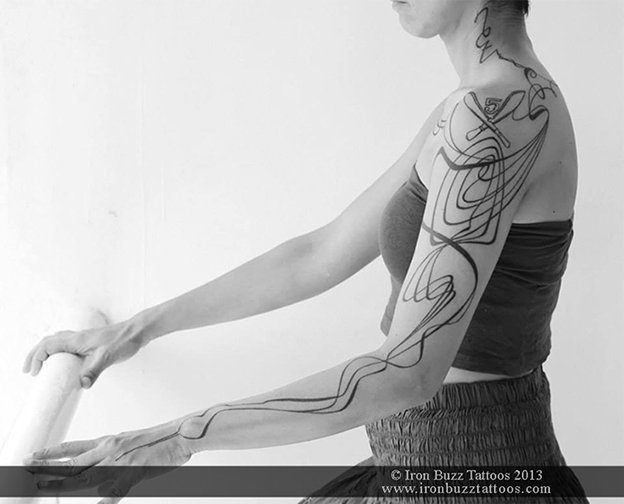 She had her old tattoo covered up (tribal dragon tattoo, see pic.) with a black rose with red splatters around. We will be adding a Phoenix tail later in the background and work on the splatters a little more and make them as red as possible. We did this portrait of Chhatrapati Shivaji Maharaj statue on Prasad who hails from the same family as the maratha warrior. The Bhonsle (or Bhonsale, Bhonslà, Bhosale, Bhosle) are a prominent warrior clan within the Maratha clan system who served as rulers of several states in India. What a way to bring an end to the 'The Lord is Back' tattoo series. 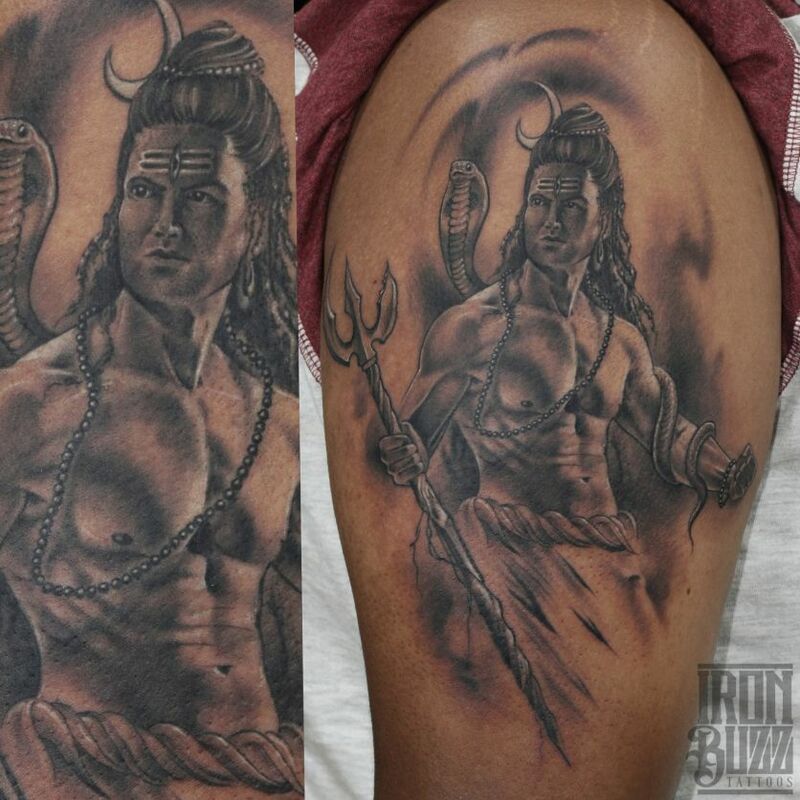 Karan traveled all the way from Singapore to get this Lord Shiva masterpiece on his arm. The idea of the series was to show Lord Shiva as a human being rather than god. His physical nature is completely opposite to the person that he is. This tattoo took close to 9 hours to complete. We'd like to thank Vimanika Comics for letting us use their idea of the tiger head on Lord Shiva's deltoid. Done using Bishop rotary tattooo machine, Inkmachines Dragonfly and Stigma Bizarre. 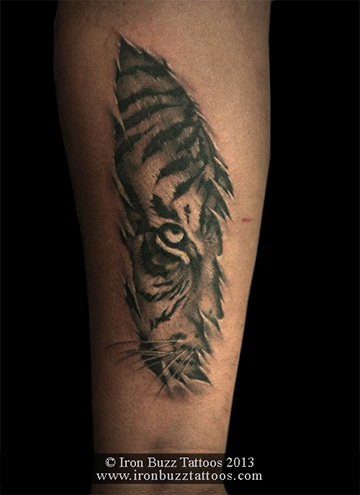 Jaguar needles by Kings Tattoo Supplly,India. Powered by Eikon. 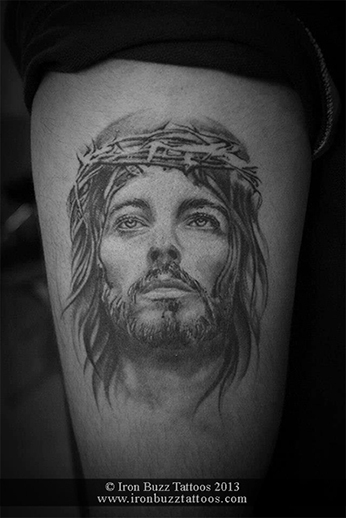 It doesn't matter which religion you belong to if you like this tattoo. Avinash got a fusion of religious symbols like Buddhism, Jewism, Islam, Hinduism, Sikhism and Christianity tattooed on his left bicep with the belief of One religion, One nation! The colors were carefully chosen for each symbol so as to make them look prominent but at the same time, UNITED! Done with Eternal Inks, Martini Da Vinci rotary machine provided by Kings Tattoo Supply, Evolved Bishop rotary machine, Inkmachines Stingray, Powered by Eikon Power Supply. 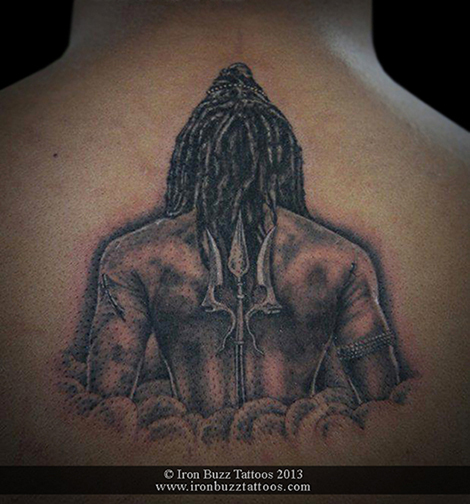 We are delighted to get a healed picture of a Lord Shiva tattoo cover-up we did on Avinash about 6 months ago. 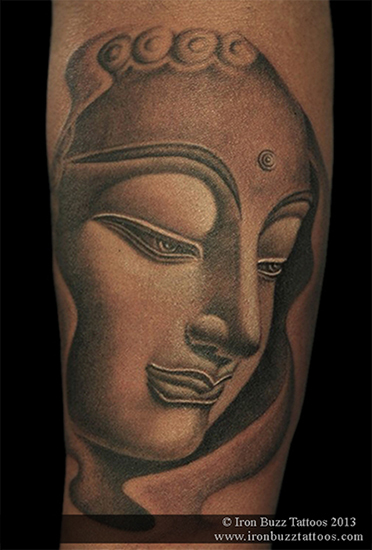 The lotus bud is placed on the wrist and is part of an all oriental sleeve. More to come soon. Done with Bishop Rotary tattoo machine, Inkmachines Stingray, Jaguar needles by Kings Tattoo Supply. Wolf as a spirit animal points to an appetite for freedom and living life powerfully, guided by instincts. When a wolf manifests its presence as a guide in your life, it could be a call to live your life more freely, to bring the intensity of passion in your everyday endeavors. Done with Martini Da Vinvi Rotary provided by Kings Tattoo Supply, Bishop Rotary, Inkmachines Stingray and Custom Dynamic Graywash by Eric. 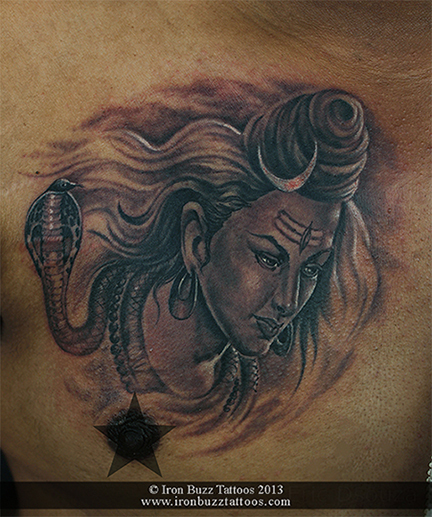 The 3rd tattoo of Lord Shiva in the 'The Lord is Back' series. 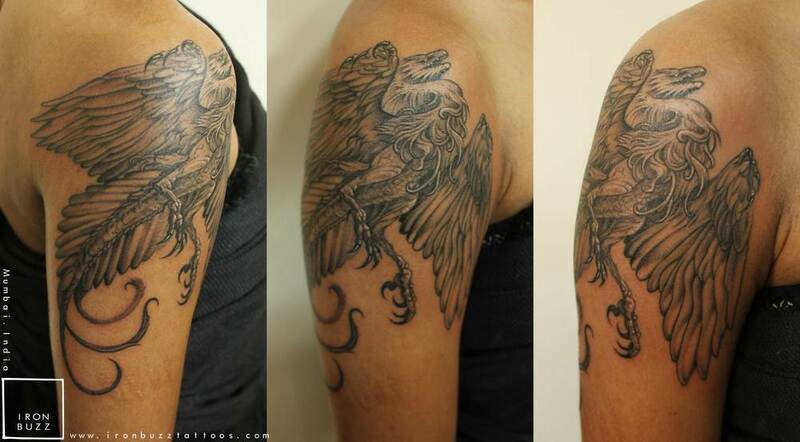 This one took roughly around 8-9 hours and Aneesh is the proud owner of this tattoo. He waited for us to travel to Pune and for an appointment for quite some time now. There was no way we would disappoint him. Though we couldn't get better pictures when the tattoo was done, we promise to upload a healed picture as soon as we get our hands on it. Sauraabh really loves his son. 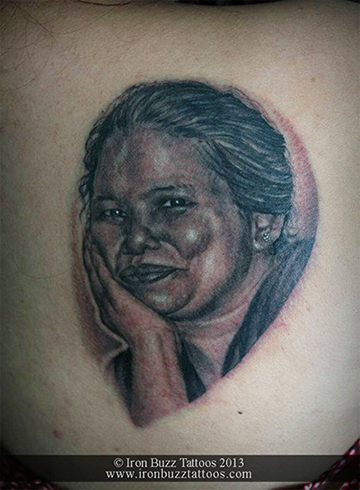 What better way to show his love than getting Vismit's portrait tattooed on his dad's forearm. This portrait took around 7-8 Hours. Done with Martini Da Vinci rotary, Bishop rotary, Inkmachines Stingray, Custom Dynamic graywash. Sanat has gone through his share of ups and downs, even after covering his face with his hands he still rises and looks at the world with great positivity. This tattoo also reminds him that time heals everything. Done with Stigma Bizarre rotary tattoo machine, Bishop Rotary and Ink Machines Stingray. 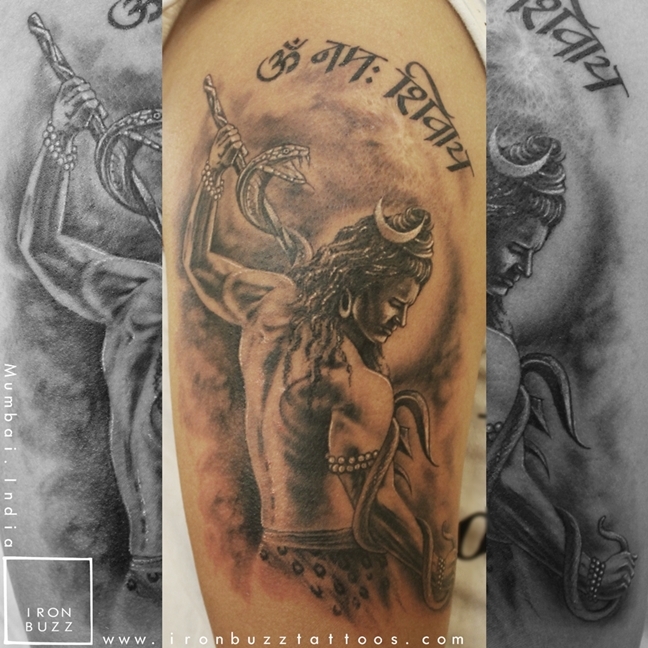 Custom Lord Shiva tattoo for Mohan. 2nd in 'Lord is Back' series. Please do not copy. The idea of the tiger on Shiva's shoulder was taken as reference from Vimanika Comics, go check them out! 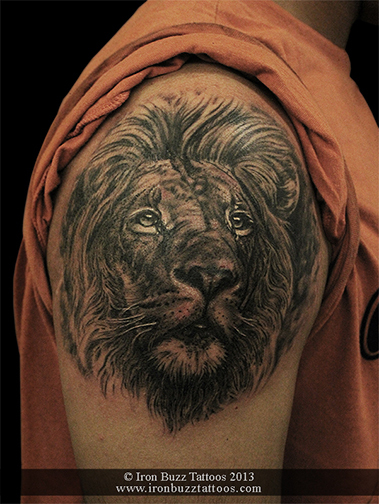 When Shobhit told us that he was looking to get an abstract lion portrait with a snake around in a size of 4 inches, little did he know what was in store for him. 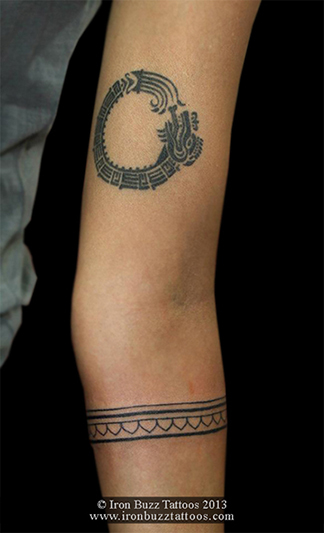 Shobhit was so impressed with the design that the thought of the design covering his forearm didn't bother him at all. He wanted the lion because he has developed leadership qualities as they are natural born leaders with pride and the snake eyes incorporated because he travels and has learnt a lot throughout his journey and to survive all by himself! Shobhit adds,"I feel my tattoo should be a reminder that i need to go forth in life with what I have, to go forth with what I have learned from my family and life so far and utilize that for future endeavors." We were honoured when a fellow tattoo artist Pawan from JG Tattoos, Pune wanted to get a portrait of the awesome Mohan Gurung (Tattoo Artist/ Owner of Mohan's Tattoo Inn, Nepal & Organizer of the series of Nepal International Tattoo Convention). 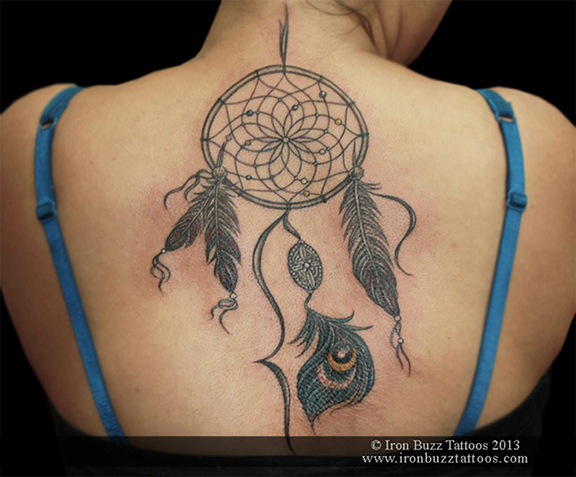 This tattoo was done at Kolkata International Tattoo Convention 2014. We didn't have a good reference picture of Mohan dai so we headed over to his booth to take one and this is the outcome. 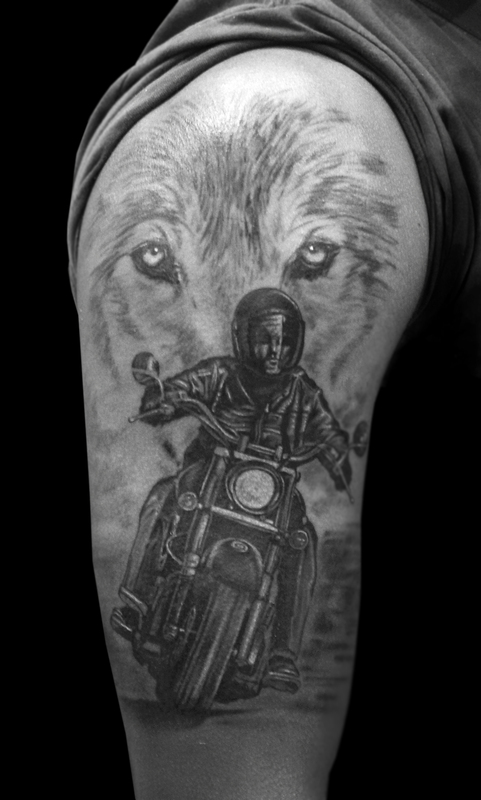 Eric won the Best Black & Grey Tattoo (small) award for this awesome portrait. 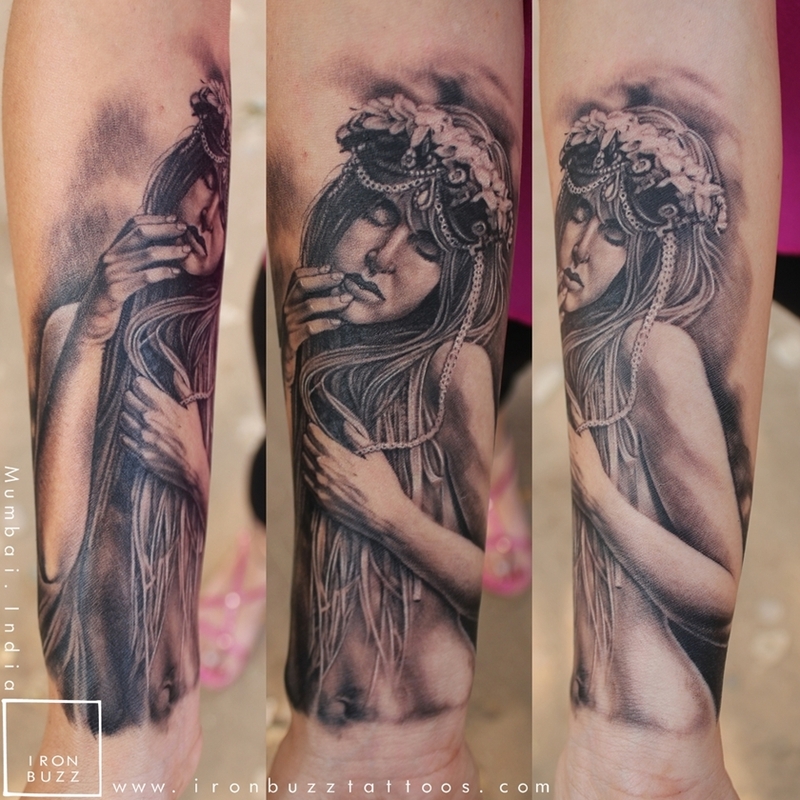 This is a tattoo Eric did on Diana's forearm. The reference was taken from a photograph called 'Within the woods' clicked by Amanda Diaz and has been used with her permission. Diana sat like a rock for nearly 11 hours. This is a good start to a whole sleeve tattoo in time. 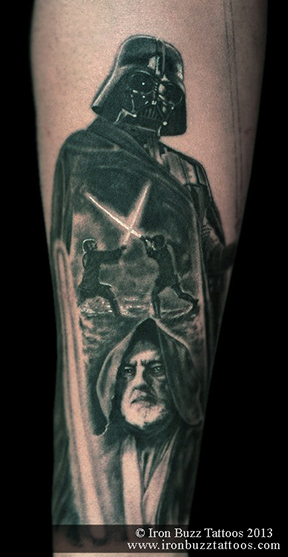 Eric was keen on tattooing a character from the famous movie series Star Wars on it's official day on May the 4th. He rounded up on R2D2 and this is the outcome. We will be taking better pictures once the tattoo heals. It was sad to know that Aabid lost his young sister on her 18th birthday two years ago and since then has been contemplating on getting a tattoo that will not only remind him of his sister but also push him forward in life and make him stronger. Love has no boundaries for people who eneter our life and for some that we have have lost. Parin lost his beloved mother two months after his baby was born. The lotus symbolizes the Buddha's nature, pure and ascendent while the Om is the primeval, audible and inaudible sound of Hindu creation. After doing a lot of research about tattoo artists in Mumbai, Mahesh chose us and traveled all the way from New Zealand to get his tattoo. 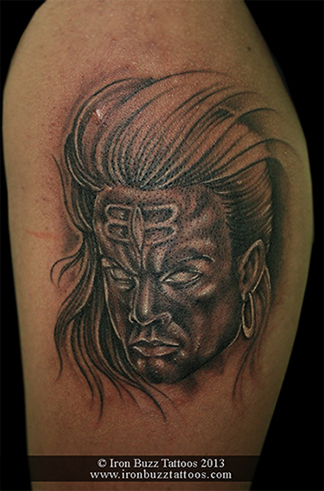 An avid follower of Lord Shiva, Mahesh wanted something unique, a tattoo that has never been done before and voila! this is what we gave him. 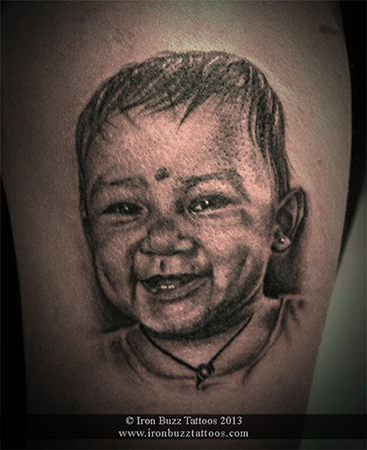 The tattoo took around 7 hours in the making and at the end of the day, Mahesh left with a proud grin on his face. The birds represent Aishwarya, her mother and her brother for the strong bond they hold for each other. The three love traveling and spend most of their time apart but still manage to be one single tight unit and each others support system. The tattoo also symbolizes the freedom of thought and action that Aishwarya and her brother got from their mother - a fiercely independent lady, the freedom to think beyond their horizons and fly independently and yet holding on strongly to their family and values. Rebecca got this tattoo in memory of her Dad who's name was 'Rock' and unfortunately suffered paralysis in his left arm. 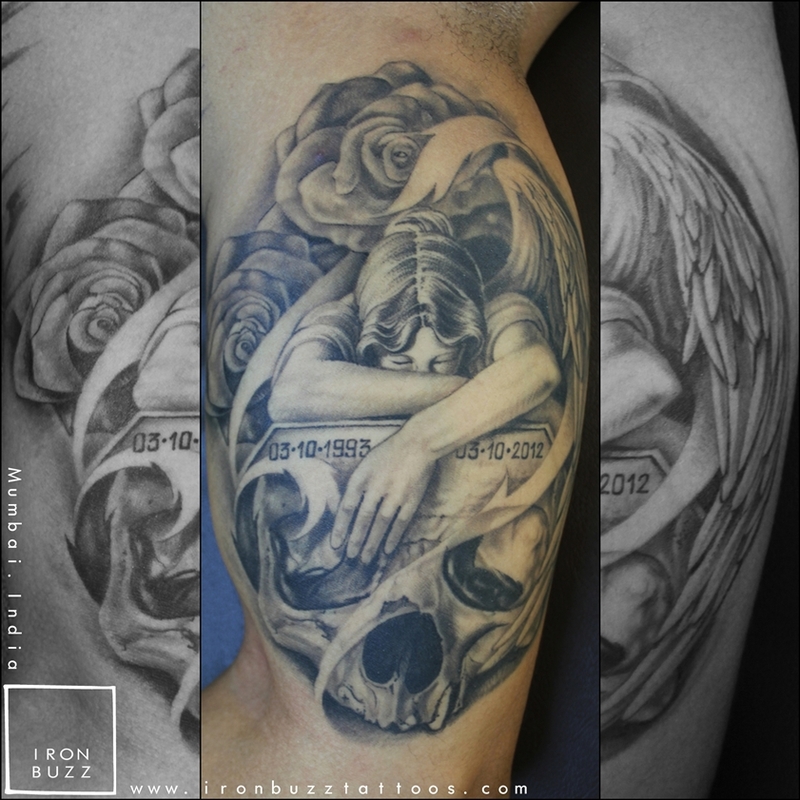 This is a custom design where the human figure in the tattoo is Rebecca's dad holding a precious Rock high in the air with his left arm and the sound of music surrounding and supporting him. Benny who is originally from Malaysia was down on a business trip to India. 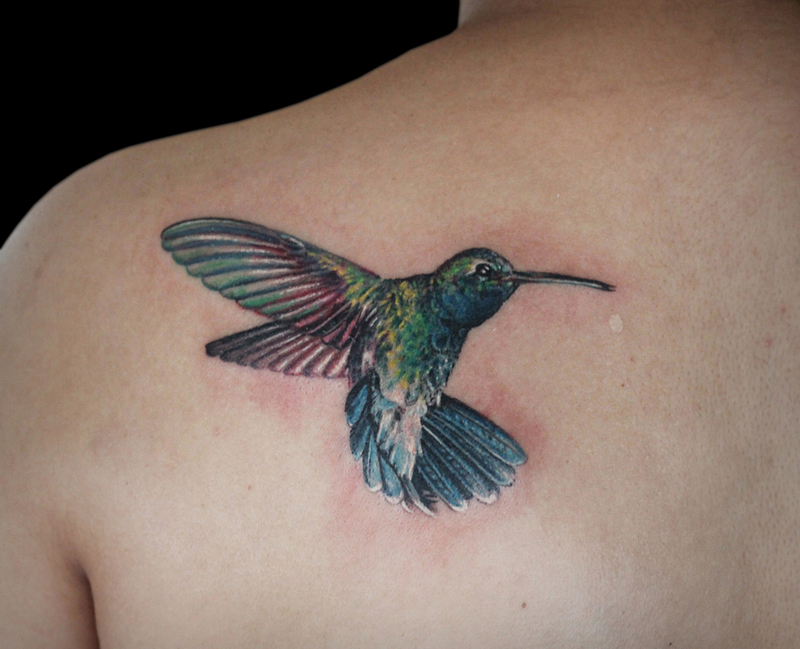 His wife had already surprised him with a portrait tattoo of him on her shoulder blade and now it was his turn! And we're glad he chose us. 7 hours went into making this tattoo worth admiring. An Anchor with the words 'Refuse to sink' is a firm sign of hope to hold on to. It means that an individual will not let a struggle become an anchor in stopping them to reach their goals. . It can be referenced back to a bible verse, "We have this hope as an anchor for the soul, firm and secure". 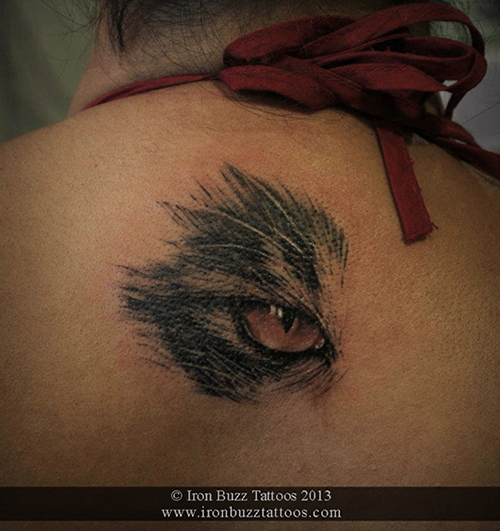 This was our last tattoo of the Year 2013 and what an excellent way to end it. It has long been accepted that an Archaeopteryx was a transitional form between birds and reptiles, and that it is the earliest known bird. It's a creature between two worlds. In many ways Sofie relates herself to an Archaeopteryx. Between her love for Art and Literature. Between spirituality and nihilism. It embodies this constant struggle that makes her who she is. Journalist for the Indian Express, Pune and The Lonely Planet, India, Kruttika Nadig got this medieval book with a quill on her forearm for her love for literature, writing and history. Her caption for her tattoo on social media says it all "When I die, I will take a book with me." Added Gandalf and Gollum to Siddhant's Star Wars/ Lord of the Rings sleeve. Total of 18 hours put in so far. 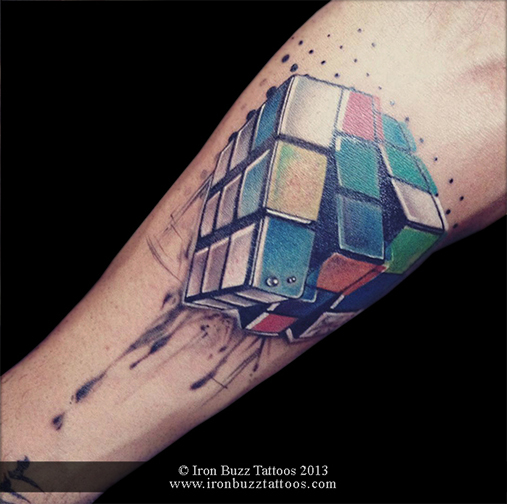 This tattoo is really special....and small (4 inches x 4 inches). 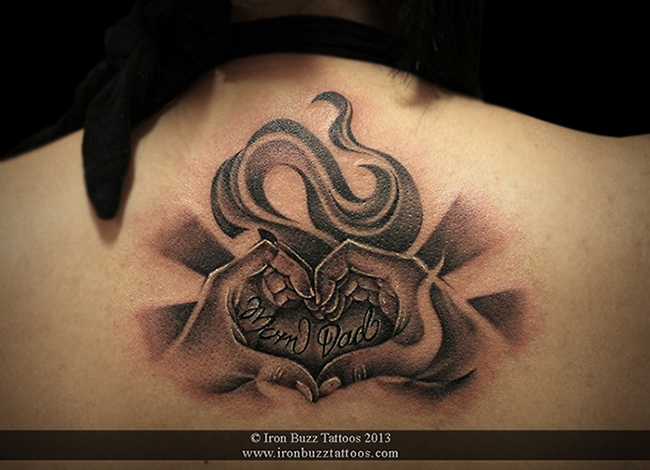 Aditi got this tattoo on her forearm in memory of her Dad. After spending a lot of time brain storming, we realized Aditi's dad would always, ALWAYS carry a bunch of keys wherever he went. The keys are a tribute to him and a short poem in the background to say how much Aditi loves her Dad. Dionne's love for her grandpa got stronger the day she permanently got the locket he gave her tattooed on her body. 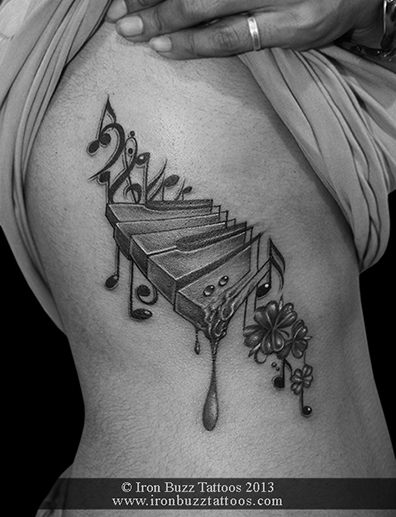 It was a pleasure to do a tattoo with so much importance to Dionne. We added the words 'My Way' on the string attached. Rhea wanted a tattoo showcasing where her roots come from and dedicating it to her parents. Our artist Eric designed this unique tree of life to depict she gets her DNA from her father (whose initials 'JG' are incorporated into the roots); through her mother (initials 'AG' in the branches), and the leaf symbolizing her existence being the only child. 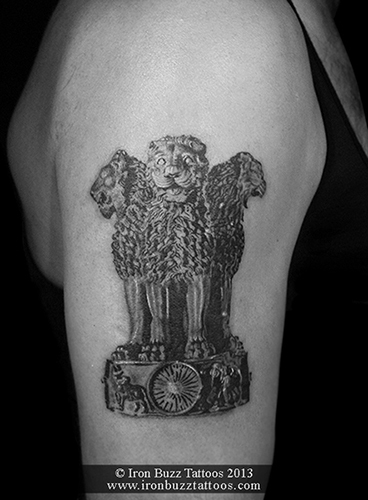 Our country does inspire many to get tattooed! The Nandi is one of them. Seen here is an elite cow dressed for the bull-worshipping festival called Bail Pola celebrated by farmers mainly in the Indian state of Maharashtra, particularly in the Vidarbha region. Custom designed for Kristen. The water goddess rising from the oceans emitting energy from her heart. Reference for the female figure was taken from one of Boris Vallejo's paintings. Call it passion or obsession, but riding a Harley is definitely an Art. Shrijit travelled from Ahmedabad to get this piece who owns a Harley Davidson Roadking. Finished it in less than 7 hours..
Did this on Mitul's chest, He did sit like a rock is why the tattoo could be executed so well. 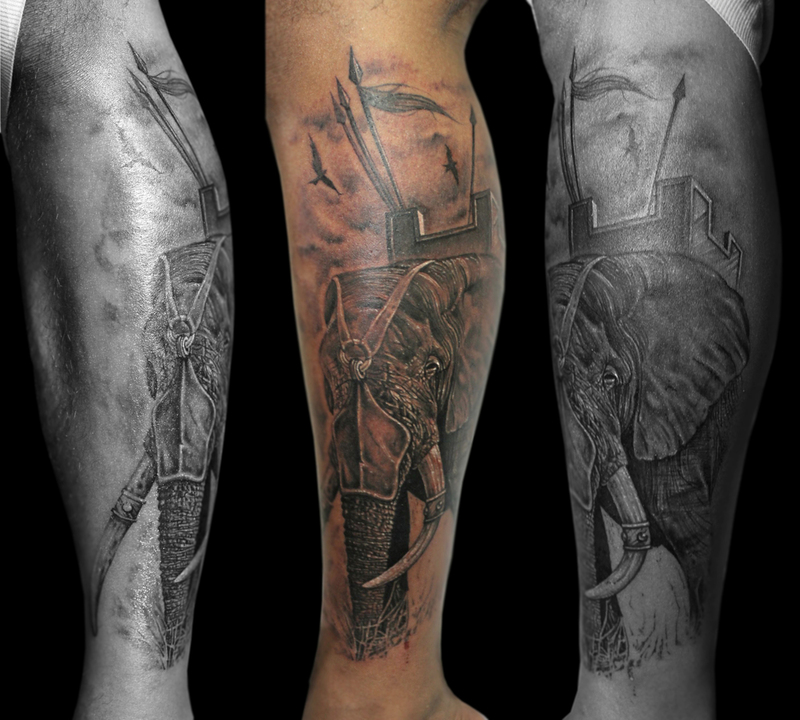 A survivor in it's battle, this Bull Elephant is done on Collin's left calf. Total of 10 hours in this piece. A mexican sugar skull on a very dear latino friend. Always lets me do color tattoos on her. Day of the Dead (Spanish: Día de Muertos) is a Mexican holiday celebrated throughout Mexico and around the world in other cultures. The holiday focuses on gatherings of family and friends to pray for and remember friends and family members who have died. It is particularly celebrated in Mexico where the day is a bank holiday. The celebration takes place on October 31, November 1 and November 2, in connection with the triduum of All Hallows' Eve, Hallowmas itself, and All Souls' Day. Traditions connected with the holiday include building private altars called ofrendas, honoring the deceased using sugar skulls, marigolds, and the favorite foods and beverages of the departed, and visiting graves with these as gifts. They also leave possessions of the deceased. Son's portrait done on his father. travelled all the way from Kolhapur to get this done. This one was done 3 years ago. 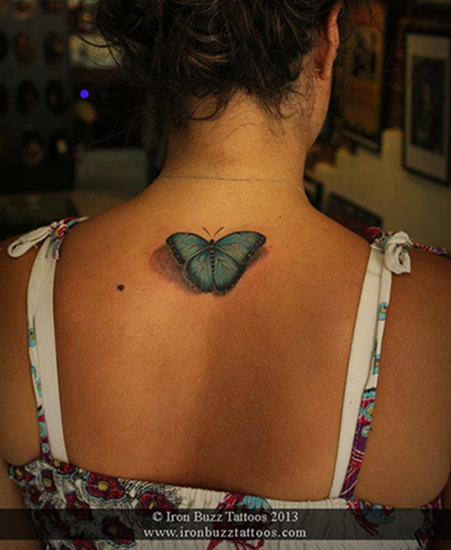 This client traveled all the way from Iran to get this realistic butterfly tattoo on her nape. 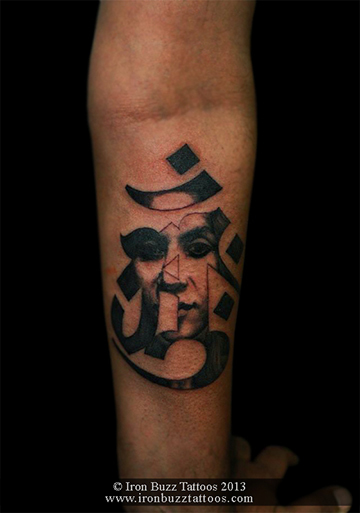 Eric did this tattoo about 3 years ago in Pune. We usually see this design with either the Buddha or Shiva but here's something for a change....The Aum symbol incorporated with his wife's portrait...any thoughts? Reference taken from artist Julie Bell's work. One of the best painters and wife to best painter Boris Vallejo. 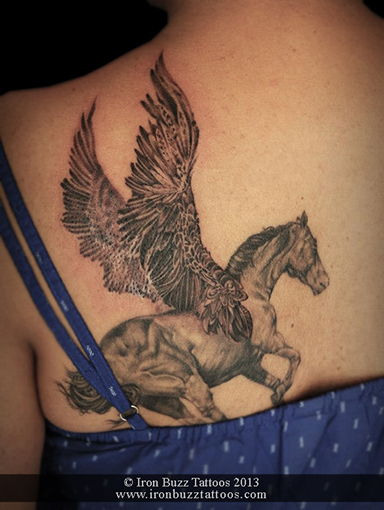 Pegasus (Ancient Greek: Πήγασος, Pégasos, Latin Pegasus) is one of the best known mythological creatures in Greek mythology. He is a winged divine stallion usually depicted as pure white in color. He was sired by Poseidon, in his role as horse-god, and foaled by the Gorgon Medusa. He was the brother of Chrysaor, born at a single birthing when his mother was decapitated by Perseus. Greco-Roman poets write about his ascent to heaven after his birth and his obeisance to Zeus, king of the gods, who instructed him to bring lightning and thunder from Olympus. Friend of the Muses, Pegasus is the creator of Hippocrene, the fountain on Mt. Helicon. He was captured by the Greek hero Bellerophon near the fountain Peirene with the help of Athena and Poseidon. Pegasus allows the hero to ride him to defeat a monster, the Chimera, before realizing many other exploits. His rider, however, falls off his back trying to reach Mount Olympus. Zeus transformed him into the constellation Pegasus and placed him up in the sky. One of the toughest cover-ups I've come across. The old tattoo is yet to be seen but another sitting would cover it completely. 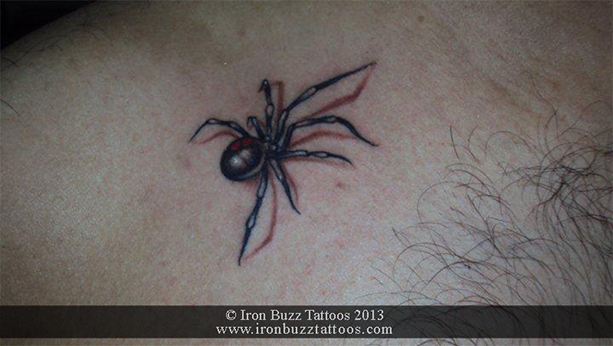 3D or realistic spider tattoo on chest. Did this tattoos 4 years ago. A lot of memories with Rahul for getting a Rubik's cube. I thank him for trusting me and my art, together we created this. 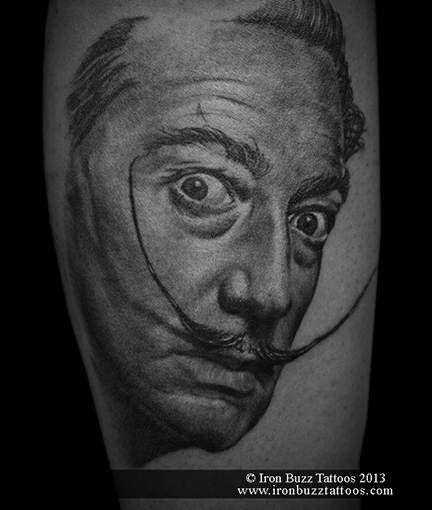 A portrait of surrealist artist Salvador Dali on another artist in mumbai. Salvador Domingo Felipe Jacinto Dalí i Domènech, 1st Marqués de Dalí de Pubol (May 11, 1904 – January 23, 1989), known as Salvador Dalí (Catalan pronunciation: [səɫβəˈðo ðəˈɫi]), was a prominent Spanish Catalan surrealist painter born in Figueres, Spain. 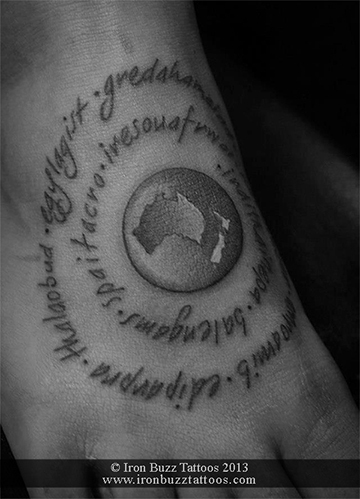 An NZ citizen who loves travelling across the world got this on her foot. The letters around are first few letters of every country she has visited till date. We will add more as she travels to more countries. 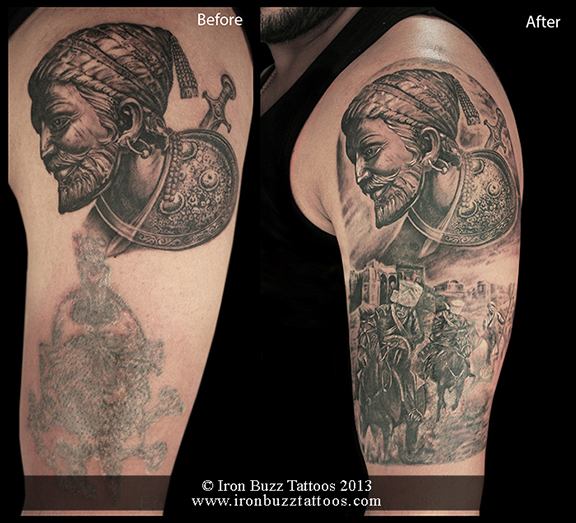 Harshal's Shivaji Maharaj half sleeve tattoo completed...it was a task to cover the old tattoo as it was darker than usual but here it is. & it will shine only for well being of people. Tiger ripping skin and peeping through. 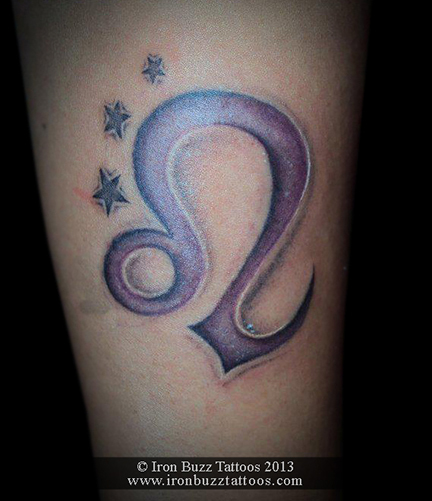 Did this tattoo 3 years ago in pune. 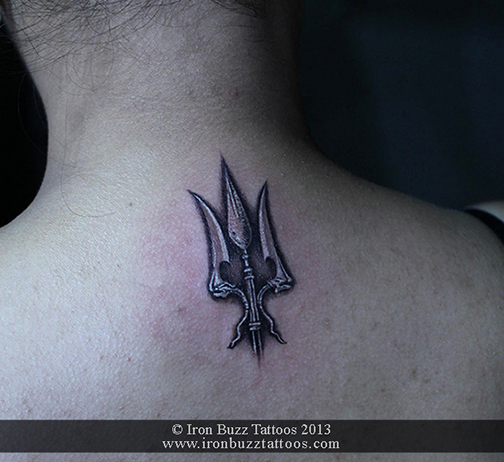 RJ Jyotika from 93.5 RED FM got this Trishul on her nape. She is an avid fan of the Shiva Trilogy written by Amish and a firm believer in the Lord. So glad we got to do this tattoo. There was no way we would do the maori turtle reference that Vishal got me. An instant push of buttons on the keyboard and voila! This happened! I'm sure Chotu (Vishal's pet turtle) will be very happy today. 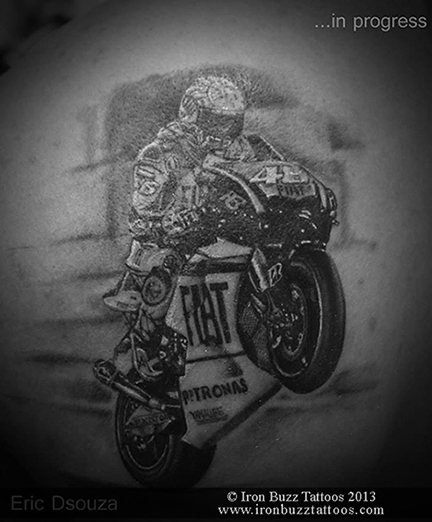 One of the special moments in my life when i tattooed a picture of none other than Valentino Rossi on an avid biker. 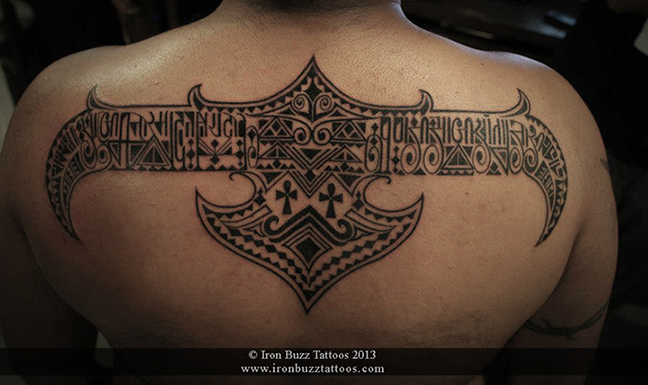 This one was done at the 3rd International Nepal Tattoo Convention in April 2013. 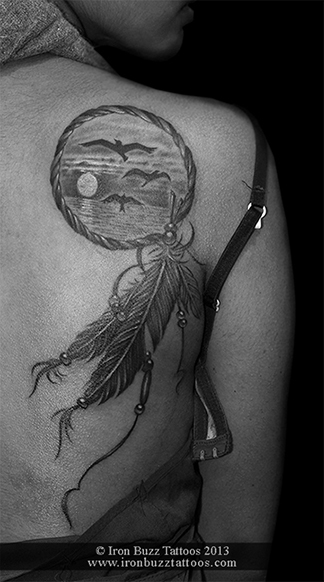 The size of this tattoo is a little over 5 inches placed on the shoulder blade. The details in this tattoo is mind boggling.